What is the difference between a 6 month Bordetella vaccine and a 1 year Bordetella vaccine? The answer: nothing. By that we simply mean that the vaccine itself is the same. The reason there are two “different” Bordetella (also known as kennel cough) vaccines is because, depending on your dogs circumstances, the vaccine may need to be boostered more often. This is based on lifestyle. If your dog is groomed, boarded, or frequently housed where many dogs go in and out of the facility (like a child that goes to day care), a six month booster would be recommended. Some facilities will require your dog to be vaccinated every 6 months. If your dog occasions Petsmart and has a few doggy friends, typically a one year booster is recommended. If your dog is more of a “people dog” and only sees other canines when visiting us here at Market Street, you and one of our veterinarians may decide that the Bordetella vaccine is not a vaccine that will be a part of your wellness plan at all. The common types of Bordetella vaccines are injectable, intranasal, and oral. They are all effective. Even visiting other dogs in open spaces, like a dog park, still puts your dog at risk for exposure. It can take up to 72 hours for the vaccination to be effective after it has been administered. The Bordetella vaccination covers different strains of Bordetella, which is highly contagious and air-borne. Bordetella can be viral and/or bacterial. The bacterial pathogen can be spread to cats. While there are many reasons a dog may cough, kennel cough is the most common reason we vaccinate with the Bordetella vaccine. It is always best to prevent the disease, rather than treat it. 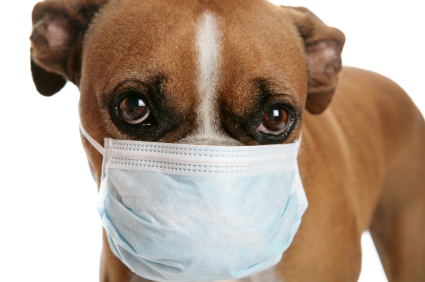 That means that the best way to prevent kennel cough is to vaccinate prior to exposure. It is also important to keep in mind that even dogs that are vaccinated still have the potential to be infected. However, it is typically to a much lesser degree, similar to getting the flu shot for a human. It is our recommendation that if Bordetella is a part of your pets vaccination protocol and/or your pet will be boarding, groomed, or having any other possible exposure, you have your dog vaccinated at least 1 week prior to such exposure, when possible. For more information, or to answer any questions you may have about Bordetella, please feel free to speak to one of our amazing team members!